Home > Staff > Deanne DiPietro, M.A. Deanne is a Botanist and Geographer dedicated to supporting a progressive approach to conservation by making science accessible. She joined Conservation Biology Institute in October of 2017, bringing a diverse background in information technology and climate change science. 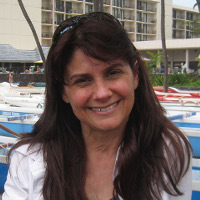 Prior to working at CBI, Deanne has worked with environmental organizations at the national, state, and local levels, including the California Landscape Conservation Cooperative, Sonoma Ecology Center, the California Natural Resources Agency, the Information Center for the Environment, and the Center for Remote Sensing and Spatial Analysis at UC Davis. Deanne lives in Sonoma County, where she can often be found enjoying nature by paddling, hiking, or working in her garden. CBI is teaming up with Riverside County’s Habitat Conservation Agency to create a habitat suitability model for the Stephens’ kangaroo rat (SKR) in Western Riverside and San Diego Counties, the species last stronghold. The Stephens’ kangaroo rat (Dipodomys stephensi) is an adorable endangered mammal of grassland habitats in southern California. CBI is helping to conserve the species using satellite technology & advanced mapping techniques. CBI is working with USFWS and USFS to identify important landscape connectivity areas in the lower and mid-Klamath Basin for the Pacific marten and the Pacific fisher.